Italian outerwear brand Allegri made its New York debut with a visual presentation at the Mercedes-Benz Fall 2011 Fashion Week. As the only presentation that was outdoors in the Lincoln Center Courtyard, Allegri produced a stunning spectacle. Allegri revealed its stylish Fall 2011 collection of coats, among the coats were some signature collaborative pieces including designers Giorgio Armani, Martin Margiela and Romeo Gigli. This clever arrangement speaks to the creativity of Allegri. 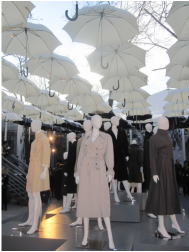 Guests walked into a courtyard transformed for the occasion with a sea of Italy’s top selling Allegri umbrellas suspended in mid-air and were surrounded by large images narrating forty years of the brand. Allegri CEO, Gian Maria Argentini stated "Few can match what Allegri does in outwear —we combine the latest and technologically advanced materials with a fit which is stylish and modern." The collection included some of original outerwear materials including Techno Wool, Teflon Flannel and Water Repellent Moleskin. Allegri has also been able to waterproof cashmere without altering its tactile experience. Allegri outerwear has mastered true garment craftsmanship using technology research functionality and comfort.